The next day, we were still glued to the TV as the awful drama of the 7/7 bombings unfolded, the Tavistock Square one was so close to Great Ormond Street Hospital that many of the casaulties were taken there for triage before being moved to A&E. A former work colleague of Andy's, Martine Wright, lost both legs in the Aldgate bombing that day, in a few weeks she will represent Team GB in the Paralympic Sitting Volleyball Team. 7 years on, our life has also completely changed - Daisy has added a few more bits of plumbing to that original gastrostomy, there has been a lot of water under the bridge in terms of her condition and things have not panned out as we thought they would but the most amazing, incredible thing is that 7 years after I held a tiny fragile little baby and hugged her as we heard our home town would be hosting the Olympics, I was able to take a feisty, determined little girl to be part of history as Team GB won its first Gold of the London 2012 Olympics! Yesterday was a perfect day in so many ways. As always military precision was involved in being able to leave the house by 7am (or a bit later by the time the older children had made several trips back into the house for things they had forgotten) in order to be at Eton Dorney, the Olympic Rowing Venue in time. Daisy was so excited, singing and signing "Row Row your Boat", the rest of us were a bit stressed as despite all our planning for meds, TPN disconnections and contingencies we had completely forgotten to factor in the other big Olympic event on in our area, the cycling time trials which were taking place in Hampton Court, this had led to road closures and delays in our journey. There are not many advantages of having a child with mobility issues, having allocated parking is definitely one of them (and a very essential advantage), the other advantage we discovered yesterday was access to our own separate viewing area, close to the finish line and with an uninterrupted view of the action - bonus! So yesterday we were there as Helen Glover and Heather Stanning won the women's rowing pair finals - we cheered and waved our union flags as they rowed past us, closely followed by the coaches on bicycles on the towpath. Daisy whooped and cheered with us, not at all phased by the crowds and the noise, just happy to be spending a lovely day out with her family. Theo coped very well and enjoyed himself. We have learned so much about how his aspergers affects him and when we took a detour to a country pub on the way home for a celebratory late lunch, Theo stayed in the car to snooze and take some time out. Previously we would have insisted he got out of the car and joined us, now we know that for him to cope with the morning's sensory overload he needed time out away from everyone and everything. Olympic fever has taken over our house, we have a Team GB flag hanging outside the house and the TV coverage is on constantly. I have seen and heard cynical, negative comments about the Olympics but for me it has always been my favourite sporting occasion. I have memories of so many previous Olympics - of the Coe/Ovett battles on the track, Daley Thomson, Olga Korbutt, Linford Christie, Sally Gunnell, Steve Redgrave & Matthew Pinsent. 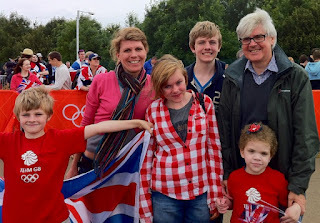 Being so close to the action is so exciting - we have seen paralympic athletes training in Richmond Park, athletes travelling in London, people from all over the world descending on our home town, I don't care about negative comments and cynicism - I am loving it. 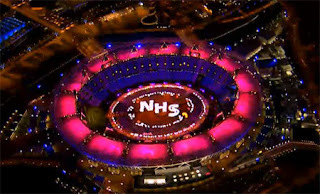 Even the most cynical can't help but have been moved by the incredible opening ceremony too - to see our wonderful National Health Service and Daisy's hospital, Great Ormond Street, feature so prominently was so emotional and close to home for us. Daisy absolutely owes her life to our healthcare system. The treatment and support she receives, at no cost to us, has allowed her to defy the odds and live a full and rewarding life. Looks like a great day out, glad it went so smoothly! 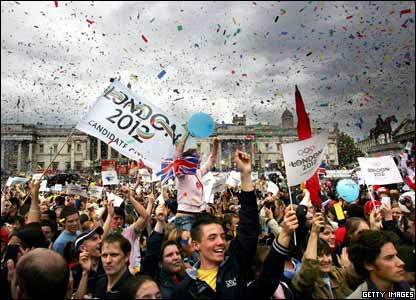 That is so wonderful you get to enjoy the olympics! We currently get to watch them on TV. (I live in united states) It is amazing how I am watching it with my children your are experiencing if first hand with yours. What a great story! You are a brave courageous fighter, and an inspiration. I was born with a rare life threatening disease, 14 other medical conditions, and developmental delays.